Last fall I had to refrain from joining any more quilt swaps because it was crunch time at work and there was holiday making to be done. 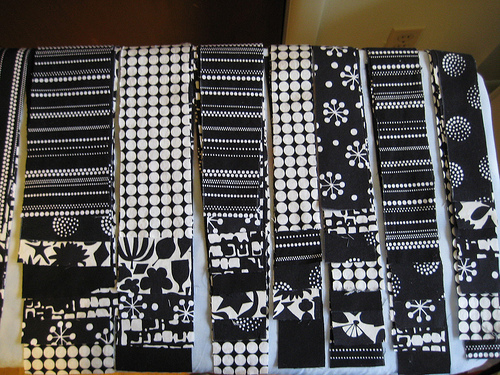 But now it’s a new year so I jumped right into the Four Seasons Quilt Swap 5 as soon as signups opened. FSQS 1-4 were doll quilts in seasonal themes and I did them all: fall, winter, spring and summer. This time around it’s a little more challenging because the quilt has to be monochromatic. Everyone had a choice of receiving a doll quilt OR a table runner and could specify the season and main color. I have a partner from far away and my brain is busy imagining what I will make for him or her. There will be a little color too, but this is all the cutting my attention span allowed today. I’m using Denyse Schmidt’s Hop Skip and a Jump pattern again because it turned out so well when I made it earlier. The fabrics were a great deal from Contemporary Cloth. Before Christmas they had everything on sale and I got 3.5 yards of these various prints for less than $30 including shipping! I try to shop locally but Memphis is sorely lacking in contemporary fabrics. This quilt is for one of my awesome knitting friends who is the Director of Development for Opera Memphis. She needs some stuff for their upcoming auction that will take place in conjunction with a wild game dinner. (We got to hear all about her trip to Mississippi to pick up a “processed” deer for this event. Not pretty! ) The money goes to their education program which brings performances to schools. One of these events at Gwen’s school revealed that Gwen loves opera and enjoys singing along with the sopranos, so we are happy to make a contribution. It’s great to be sewing again after the knitting rampage that took place right before the holidays! There is one really nice project on the needles but it is a gift and can’t be shown yet. I’ve also selected a pattern for some Christmas 09 knitting and have all kinds of projects lined up to start after the quilts are done. Yay for a new year! This entry was posted on January 10, 2009 at 10:57 pm and is filed under Uncategorized. You can follow any responses to this entry through the RSS 2.0 feed. You can leave a response, or trackback from your own site. yay! glad you’re back to blogging and sewing! yay the Dolphin is mine. Glad you are doing this swap again. You are super organised this year.